At St Philip’s we develop independent, confident, accurate and inspirational writers as part of our English teaching. It is essential that writing knowledge, skills and understanding are then applied across the whole curriculum in order to embed learning. We always aim to provide a purpose for writing and make writing engaging for all children. Children are encouraged to not only write to the best of their ability but to also independently improve and edit their own and other’s work. We use a range of stimuli to engage children in the writing process including the use of visual images and film, literature, drama, music, practical resources, and educational trips and special days. Children are taught how to structure their sentences grammatically, and to use ambitious vocabulary, in order to ensure the most impact upon the reader; they are given the opportunity to apply their skills in weekly extended writing tasks in both English and across the curriculum. Teaching and learning develops pupils’ competence in both of these areas. In addition, pupils are taught how to plan, revise and evaluate their writing. Writing down ideas fluently depends on spelling quickly and accurately through knowing the relationship between sounds and letters (phonics) and understanding the morphology (word structure) and orthography (spelling structure) of words. 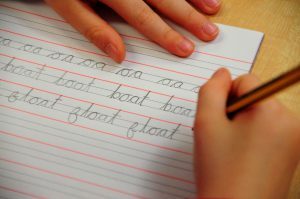 Handwriting is an important part of the curriculum, children are taught the early stages of joining their writing in year 1 and children are expected to join their handwriting from year 2. We use a cursive script to enable children’s writing to flow. Opportunities for teachers to enhance pupils’ vocabulary arise naturally from their reading and writing. As their vocabulary increases, teachers show pupils how to understand the relationships between words, how to understand nuances in meaning, and how to develop their understanding of, and ability to use, figurative language. They also teach pupils how to work out and clarify the meanings of unknown words and words with more than one meaning. As part of grammar teaching and learning, pupils are taught to control their speaking and writing consciously and to use Standard English. Pupils work hard to learn the correct grammatical terms in English and understand and use these within their writing.